After a year of preparation and two false starts, I finally got my Winter War Campaign off the ground yesterday at the Hobby Bunker. It is funny that when I look back the easy work was painting the figures and getting the terrain together, the really tough work is campaign design. I really have to admire the work put in by Rich Clarke in his "Pint-Sized Campaigns". Not only do you have to have a grasp of history but you have to be able to design an interesting campaign. After reading around the Winter War, I decided that Battle of the Raate Road would best lend itself to a short but interesting campaign for Chain of Command using the At The Sharp Edge campaign supplement. Here we have a 5 day battle fought over a relatively small area between two very asymmetric and different forces under very adverse conditions. Being a relatively novice WWII gamer, I felt it best to stick as close as possible to the army lists and the campaign supplement as available from Too Fat Lardies. 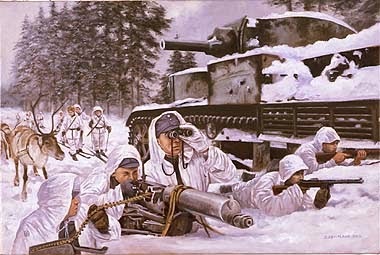 For the first two months of the Winter War the Soviets are rated as green and the Finns elite. This pits a large force of 62 men against a small force of 36 men, with the large force having a +9 advantage in supports. Sounds good but when it came down to it, it was an uninteresting experience for the Soviet player as he has lots of men but very little command ability and very few tactical options. Historically correct maybe but boring to play. The Too Fat Lardies games have an excellent cadre of players so as usual I referred my problem to the User Forum. After some discussion, I have made some modifications to my original plan to hope for a more interesting campaign. I plan to put together a pdf of the campaign when it is completed, but the general outline is as below. Finnish CO Orders: You lead an elite Jããkiri platoon. Advance north to find where the Soviets are concentrated, then skirt along the Raate Road east 20 km to the Soviet command post at the Raate Border Station, attack the border station and kill General Viogradov, commander of the Soviet 44th Rifle Division. Along the way hary the Soviets forces. Soviet CO Orders: You command a green force of Ukrainian recruits. General Viogradov has ordered the 44th Rifle Division to retreat back to the Finnish-Soviet border along the Raate Road. Your specific platoon has been ordered to provide rearguard action as the division retreats. Make your way to the border where you will join up with the 3rd NKVD Border Regiment. The campaign structure is a unilateral 4 rung ladder. 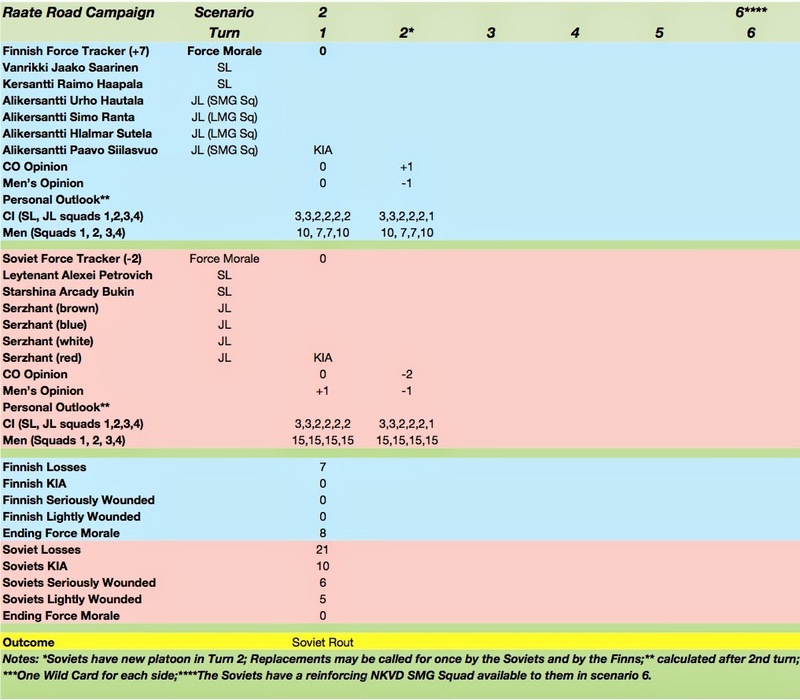 Scenario 2 and 6 from the main rulebook will be used for the 1st and 4th rung. The scenarios for rungs 2 and 3 will be selected according to the tactical situation, with the previous game's loser making the selection. Victory for the Finns is taking the border station within 6 Turns, anything else is a Soviet victory. Army lists: the official CoC lists for the 39-40 Soviets and Winter War Finns. To make the game more playable the Green Soviets will have 5 CD and able to deploy a complete squad in entrenchments. Attrition will accumulate on both platoons. The CO's and yours Men's Opinion will be calculated after each scenario. The Platoon Leader's Outlook will be calculated after Turn 2. Replacements can be called for once by the Soviets and once for the Finns. A Wild Card will be available to each side during the campaign after Turn 3. Terrain: No normal terrain. For Infantry, the road itself and it's edge is Broken Ground, the Forests, Hills, Lakes and Exposed Ground with Scrub is Heavy Going while the Snow is Really Heavy Going. All Vehicles are confined to the Ice Road. I sort of screwed this up as I wanted to get the centre JOP (blue) in the exposed ground. Mike played it conservative and did not advance his markers up the table, I was a little surprised that he did not put down entrenchments for his infantry squads. As usual I forgot to take any photos during the game, but I did advance my HMG team to within close range of one of the Soviet's deployment areas so was able to plink away with some success, I did take some casualties but was able to hold on until the Soviet's routed. Hard to see but I advanced my second LMG section through the woods in the far ground followed closely by one of my SMG sections. Here we have one of the Soviet squads in light cover behind a snow drift, They did take some attrition but did not break. You can see a second Soviet squad in the far ground also behind a snowdrift. Just behind it is a BT7 Light Tank. It's firepower of 4HE was pretty useless I thought. A truck mounted Quad Maxim would have been the business! Here is the 3rd Soviet squad in light cover, by now they have been a little chewed up. You can also see a Soviet Maxim entrenched in hard cover behind the fence. It is from in front of this fence that the 4th Soviet squad launched a heroic attack on my weakened LMG squad in the forest. It was 16d6 on 16d6, but the small size of my section caused it to be destroyed while the Soviets survived but with significant shock. My SMG team advancing through the forest, ready to mop up the Soviets. So our first game was a Soviet rout, as their morale fell to zero before they could withdraw. Certainly we identified that as set up this is a somewhat uninteresting game from the Soviet perspective, which I hope will be corrected by increasing the Soviets Command Dice to five. Mike was unlucky though, he only lost 21 men, but every time one of his squads had a kill on it, his test for wounding a leader failed and he had to take multiple morale tests which brought him down to zero in a little over two hours. Let's hope the next game is more interesting. Great report! Awesome looking game! Thanks, I hope the second game has all the bugs ironed out. Really interested in this as I'm working on a WW2 project of war in winter on the Eastern Front. But in 6mm. Working on the terrain now and hope it looks as good as yours. Look forward to seeing the board. I'll keep an eye on this, looking good already! Awesome looking game, love the gaming mat! It is a nice mat, I think I may purchase the one without roads as well. Great report! Nice to see someone playing Finns :) That change to the Soviet order dice sounds like a good change. With the original rules they are a bit boring to play as you said. I like a defensive roll and can be patient, but the Soviets at 4CD do not do much. That's a nice looking game! Superb table John. I love CoC but it can be a bit tricky with elite vs poor. We quit our Arnhem campaign as the Brit paras just took it to the Germans. A couple of games I seemingly lost at setup. I hope you iron out the rough spot and have a great campaign. Thanks Monty, we will have to see. Hello John, I've been going back and forth looking through your page here and was curious if you ever put together your Winter War campaign pdf? I have a ton of Winter War stuff and want to get it rolling on the table. I have several questions concerning the handeling of the Finns. Any assistance would be be greatly appreciated. You may have answered some on the TFL Forum for CoC. Thank you.